The air fryer vs oil fryer battle has been raging for some time now. While oil fryers have their own merits, some people tend to prefer air fryers (especially for health reasons). To aid in your decision, we’ve compiled a list of the best oil less fryer reviews. We’ve done a ton of research and review to bring you the best! Here are some things you should know before we get started. 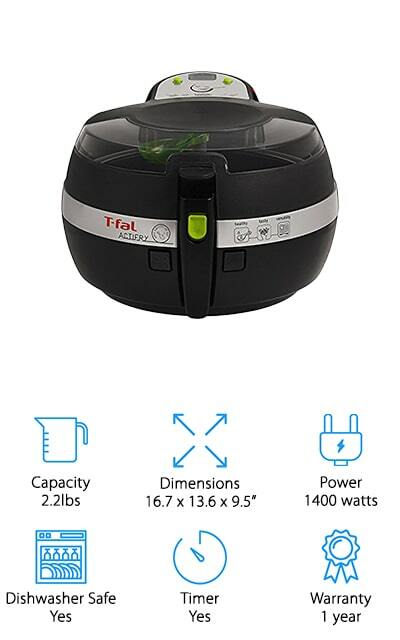 Capacity: How much can the fryer hold? If you have a larger family, go with a larger capacity fryer. For smaller families, you won’t need so much space. It ultimately depends on what you’re using it for. Dimensions: How big is the fryer? Are you looking for a countertop device or something that you can sit on the porch to fry a Thanksgiving turkey? This can help clue you into which device might be best for your uses. Power: How is it powered, and how much power does it consume to run? Electric fryers can get expensive, though there are some that run on propane instead to get the same results. The choice is yours. Dishwasher Safe: This generally refers to the ability to throw the various components in the dishwasher after you’re done the frying. It’s important to know how to clean your fryer correctly so that it will last a long time. Timer: Timers can help you set your fryer to continue running for a select amount of time. This is important if you’re using it in conjunction with other devices or doing something like frying larger meat portions. Warranty: A warranty means that a company stands behind their product. If it breaks down or stops working in any way during this period, you can get a replacement or a refund. It’s a vote of confidence in their product. Now that we know a little bit more about these types of fryers, we can get into the oil free air fryer reviews. We’ve chosen devices for this list that will give you the best results without using oil, meaning you can make great food in a healthier manner. Our top pick and budget pick are our personal favorites, so check them out first before getting started on the other oil less fryer reviews. 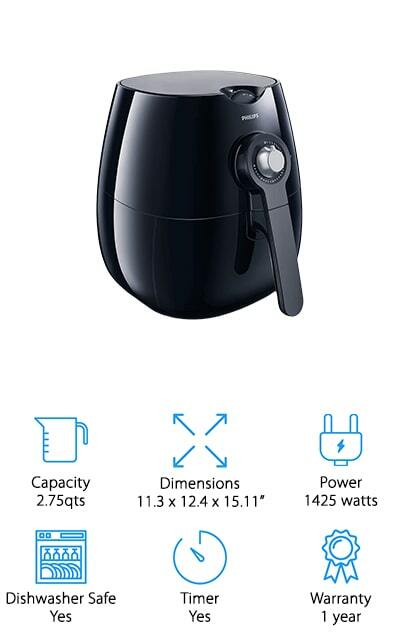 Philips makes this amazing Viva Air fryer that might just be the best oil free fryer on our list. It’s got a patented design that sets it apart from other fryers. The starfish shape allows more even cooking and faster heating than standard fryers, and we think that’s pretty amazing. The basket holds an amazing 28 ounce of food or 2.75 quarts. It’s just the right size for the standard family! With this bundle, you get a cookbook with information on the best way to use your air fryer and a ton of different recipes to try. Air fryers have been shown to cook food with 75% less fat than an oil fryer, so if that’s something that you require, this is the fryer that you should try out. This thing is reliable and will fit right on your countertop for your everyday frying needs. The power output is only 1425 watts to save on your bills! 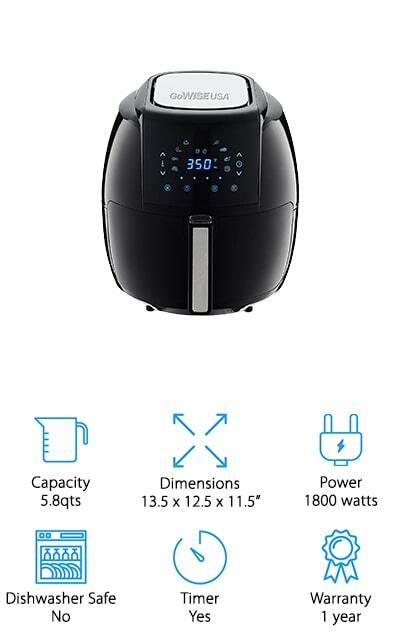 Next up on our list is our choice for the best inexpensive air fryer. It actually has a larger capacity so you can make more at once. GoWISE boasts that this fryer can be used to make pizza as well as steak and shrimp. It will fit on your countertop with a bit of maneuvering, and the large basket and capacity more than make up for the loss of space. You can stop a cook cycle and change the temperature with a new Start/Stop button they’ve added to the unit, which is a great feature for multiple dishes. It also includes an alarm function that reminds you to shake your basket of food at 5, 10, or 15-minute intervals. This fryer wants to make sure you don’t burn anything! Plus, it comes with a small recipe book with ideas for each meal inside. 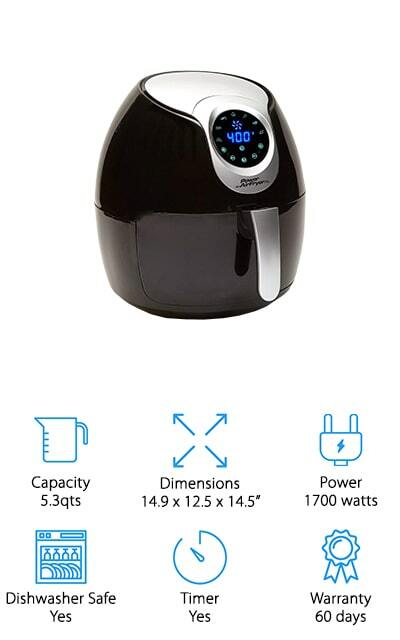 This oil less air fryer is one of the good ones! T-fal is another popular name when it comes to cooking appliances, and for good reason. The ActiFry can hold up to 2.2 pounds of food, and it’s great for cooking French fries. It uses a heat pulse system to help circulate the hot air that is doing the frying, that way you get even cooking all the way around your food. It’s easy to use because the LCD screen where you set the timer and other features are large and easy to read. You can put almost every component of this machine in the dishwasher when you’re finished cooking with it, reducing clean up time and frustration. You’re going to love how the foods that come out of this fryer taste. The unique stirring paddle even helps to facilitate the process, when you use with some of the best oil for air fryers in small amounts. We love this air frying machine and you will too. Avalon Bay makes one of the best oil less deep fryers that we could find because it uses a rapid air technology. This process mimics how regular deep fryers that run on oil cook your food. This allows you to get that perfectly crisp outside without the use of any oil whatsoever. It can hold up to 3.7 quarts, so it’s great for a regular-sized family and is made of non-BPA plastic. You can take the basket off of the fryer in order to transport and serve your food, which is a nice perk all things considered. Don’t sacrifice taste for health concerns – when you get an oil-less fryer you can still have great-tasting food without the risk. This includes a non-stick baking dish as well, and a multi-use rack for cooling your food. It also includes a cookbook with recipe ideas. This is an amazing little fryer that becomes a great jumping-off point for healthier cooking. 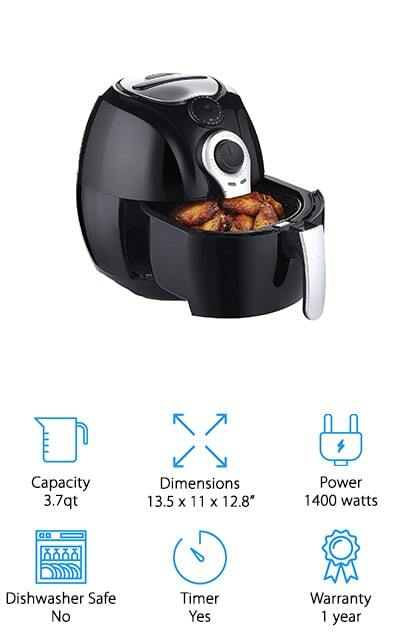 This fryer by Power is extra-large when it comes to in-home frying. 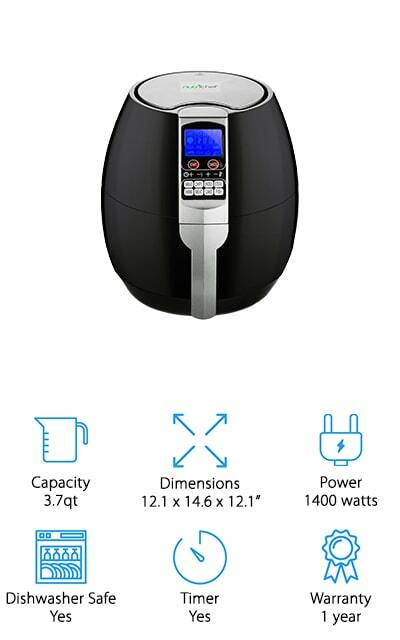 It pulls an amazing 1700 watts to quickly and effortlessly cook your food without the assistance of oil. It’s great for preparing any meal that you already make with a fryer. The company even boasts that this fryer can replace just about any other kitchen appliance for you, which is an amazing claim. It surrounds your food with rapidly-heated air in order to get the same results as oil frying but without the additional fat. Even though the inside can get up to 400 degrees very quickly, the handle on the top stays cool so you can check on your food without burning yourself. This fryer comes with a baking insert, pizza pan, and tongs. Every part of it besides the machine base is dishwasher safe for super easy cleanup. The 7 presets will give you great results no matter what you’re cooking. Masterbuilt makes this Butterball Fryer that is specifically made for air frying turkeys. The double-walled construction on the inside of the fryer helps to seal the turkey’s skin by using radiant heat. This allows the juices to stay inside the turkey and absorb during the cooking process, leading to a tender, juicy bird that will wow all of your friends. It can cook a turkey up to 18 pounds, which is great for larger families during the holidays. It even includes a wood chip box in case you want your turkey to have a specific taste in the meat, and you can clean out the drip pan easily in the case of any dripping. This monster is best placed outside when you’re cooking your turkey because it’s a rather large machine. Still, it’s a great alternative to oil turkey fryers that will make your holidays a lot healthier. Your bird is going to taste amazing this year! One of the best oil less air fryers on our list comes from FrenchMay. This fryer works entirely on touch controls, and you can use it to cook a wide variety of food, from French fries to steaks and vegetables. Everything tastes better when it’s fried by air instead of in oil! It uses Dynamic AirFlow technology that allows your food to get crisp and delicious just like they would in an oil fryer. You can set a 60-minute timer if you’d like, and there are seven different presets for different types of foods. The 3.7-quart capacity can feed a family of four. You can even make a cake in this thing! It’s a versatile machine that is an asset to any kitchen set up. In addition, most of the machine is dishwasher safe so that you can easily clean up. The basket has a cool-touch handle and housing so that you can shake the basket even when it’s hot! 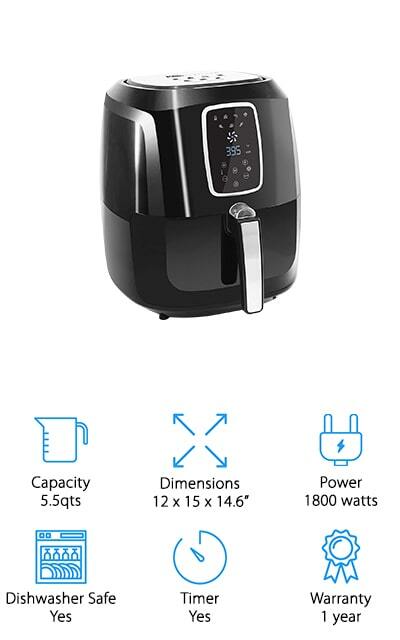 Maxi-Matic makes this amazingly large 5.5-quart air fryer that can help you in all of your cooking endeavors. It comes with a full-color cookbook to help you get started with some amazing recipes. This fryer can use temperatures between 180 and 400 F degrees, and you can change the settings with the touch screen on the front of the device. This screen also includes multiple other settings, including a timer and a total of seven functions and presets. If you’re looking to make just about anything a little bit healthier, this is the way to go! All of the removable parts are both nonstick and dishwasher safe so you’ll never have to struggle with cleaning up. There’s no oil to dispose of, either! 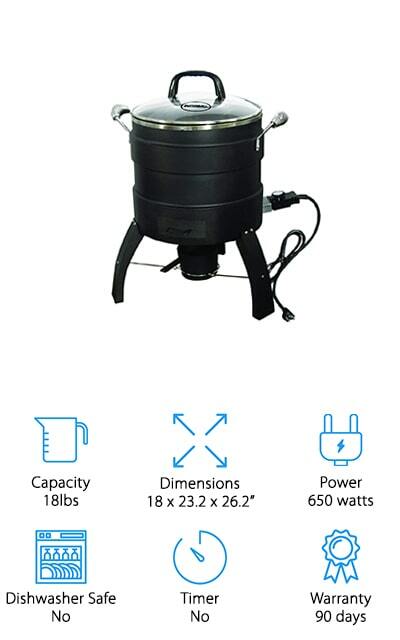 You can cook up to 4 pounds of food in this amazing fryer, and your food will come out with up to 80% less fat than if you were cooking in an oil fryer. Char-Broil takes center stage with one of the best oil less fryers on our list. You know that when you see the Char-Broil name, you’re going to get a quality product. This is a little different than the other fryers on our list because it runs on propane rather than electricity. However, it performs the same functions as an electric unit, providing you with great, flavorful food. 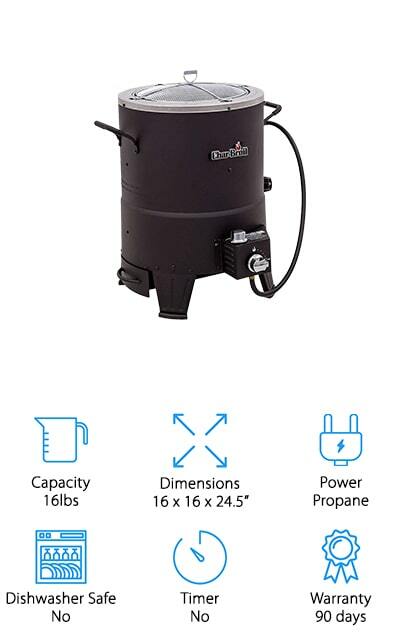 This particular unit is great for cooking turkeys, specifically. Air fry a turkey up to 16 pounds in this amazing fryer, keeping your holidays and special occasions crispy and delicious. It comes with a basket, of course, as well as a lifter to help with heavier birds and a meat thermometer so you know it’s done. It doesn’t get much more convenient for this. The infrared cooking system helps cook food evenly and leave it juicy on the inside with a crisp, delicious outside. Plus, there’s no oil to dispose of! 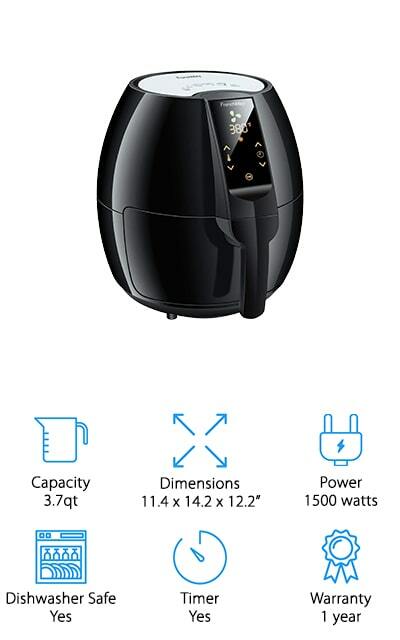 NutriChef is one of the leading names in chef and kitchen appliances, and this 3.7-quart portable air fryer is just as well-made as their other devices. It’s small enough to be portable, which is especially useful if you happen to be cooking at a friend’s. It comes with a digital LCD display that you can use to change all of the settings, including the timer (which you can set up to 30 minutes at a time). Temperature is also adjustable, and it runs from about 176 degrees to 392 degrees so you can cook just about anything. We love that the temperature on this one is adjustable. It can fit on your countertop and get the perfectly crisp fry on your food without the oil, which makes it contain less fat overall. The cooking pan and basket are dishwasher safe, while the rest of the machine can be wiped down easily! You’re going to love how great food tastes!